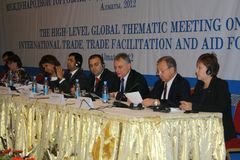 High-level Global Thematic Meeting on International Trade, Trade facilitation and Aid for Trade was held on 13-14 September 2012, in Almaty, Kazakhstan. The meeting was attended by Ministers of 30 land-locked countries, representatives of the United Nations Member-States, including transit developing countries and the countries of United Nations Organization as well as representatives of international organizations. 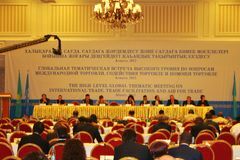 Within the framework of the Pre-Conference Event for the Ten-Year Review Conference of the implementation of the Almaty Programme of Action there were discussed the role of transit transport and ancillary infrastructure development for increased trade opportunities. Mr E. Biriucov, Secretary General of TRACECA noted that, participation of financial institutions in the meeting is an opportunity to establish a mutually beneficial dialogue that will enable the participants to apply joint efforts in approaching the problems of transport communications, coordinating the actions of international organizations and financial institutions regarding the development of Euro-Asian transport links, implementation of infrastructure projects, as well as promotion of institutional reforms and facilitation of border crossing procedures. In order to develop growing freight flows, the countries, international financial and specialized organizations must combine efforts with the view of further developing the existing transport corridors and searching the ways of enlarging their geography. Of no small importance is the creation of attractive conditions for freight traffic which becomes possible under multilateral cooperation, well-thought and coordinated transport policy of all involved countries and open access to the market. Undoubtedly a significant factor in the development of the transport sector is the development of infrastructure. 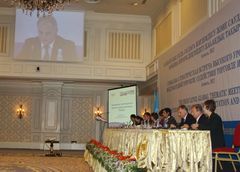 In the course of the Meeting there were discussed the current status of road transit transport infrastructure, logistics services and performance of corridors in enhancing trade in the region, examined ways of increasing the efficiency and cost-effectiveness of the main transport corridors to landlocked countries and elimination of physical and non-tariff barriers.